We have a train by the seaside perhaps. Am sure someone can expand on that - where, what engine, type of train? The loco is clearly a Precursor 4-4-0, the coaches are LMS non-corridor excursion stock so the date is well into the 1930s. The signals are LYR so the location must be the Fylde on a four-track section by the coast, presumably the approaches to Blackpool Central. The lettering on the roof advertising 'Deck Chairs' gives another clue. I would guess that it's between Blackpool South and Blackpool Central stations. I guess this is on the Chester & Holyhead line, with the train heading east and about to enter Abergele station. Can't find another photo as evidence, but the track plan with the sidings and crane suggest this location. If so, the beach would be immediately to the right, and the hire of deck-chairs would be very convenient. Here is an aerial photo (from Britain from above) of Abergele which whilst small seems to confirm Harry's suggestion. There is the group of cottages alongside the line as can be seen in the mystery picture. But Harry, the signals are surely L&YR! Well Philip, the signals look LNWR to me. But, if they are L&Y, couldn't they have been moved here by the LMS? When the famous Rugby gantry was dismantled, some of the components were re-used on ex-L&Y lines. Or so I was told by a neighbour who had been a clerk in the L&Y and LMS Signal & Telegraph Dept at Hunts Bank, Manchester. I don't think I ever saw any ex-L&Y signals on ex-LNW lines, but after 1922 perhaps such a thing would have been possible. The shape of the signal spectacle plates looks L&YR to me - the LNWR and LYR spectacles were markedly different. Or perhaps on second thoughts I am seeing the silhouette of the lamp casing rather than the shape of the spectacle plate. The picture is not very clear. I have never heard of and know of no example of LYR signals being positioned on LNWR lines. If anything the other way � several signal cabins on ex-LYR lines were replaced by LNWR types. Pre-WW2 postcards of Abergele beach (found by googling) show a house on Pensarn promenade whose roof and chimney details exactly match those visible in this photo. So the Precursor would be on the Up slow line, about to enter Abergele station, and it looks as if the photographer was in a train at the Down platform, just under the road overbridge. (See track plan, Fig 59 in 'Chester to Holyhead Railway' by V. R. Anderson & G. K. Fox: OPC, 1984). I am almost certain that the photo was taken at Abergele looking west. 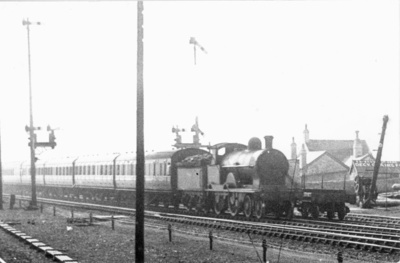 The train is about to enter the station and is travelling east towards Chester. I attach an image of the 2 chain plan dated 1912 covering the location at 213 1/2 miles from Euston. The crane and the signals are shown on the plan. The house in the background was sold by the LMS to Abergele & Pensarn Urban District Council in June 1923. (click on photo above for larger image and image of plan).